The next time you’re taking a trip from Columbus to Starkville (or realms beyond), keep a weather eye out for the service road to your left. A number of construction projects, new and old, are cropping up there like flowers in Springtime. 1521 S. Frontage Road, just past the Macon/Meridian exit, will house the new combined West Point-Starkville-Columbus office location for Atmos Energy, which will replace their existing offices in those areas once it opens its doors (scheduled for this September); existing employees will be shifted to the new office. Kingdom Vision International Church is working on adding to its new building at 2467 S. Frontage Road. They hope to open up the new multi-purpose center and gymnasium in late 2019. Exceed Technologies and Mississippi Alarm arecurrently building new structures at 2787 S. Frontage Road, and they hope to move in by mid-October. A bit further on, nearer the GTR Airport exit, Stribling Equipment is building their own new facility. They sell heavy equipment, and have found the need for a more centalized, larger location in order to better serve their customers. They hope to complete the move by January. Sunbelt Rentals opened its Columbus location 645 Highway 45 S., this past June. It offers rental construction equipment for everyone from large contractors to individual homeowners who need some special tools for their favorite project. 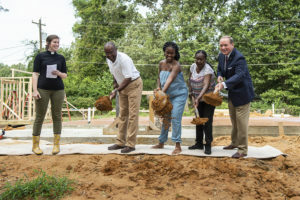 Mississippi State University and Starkville Area Habitat for Humanity recently broke ground on their tenth Maroon Edition home. 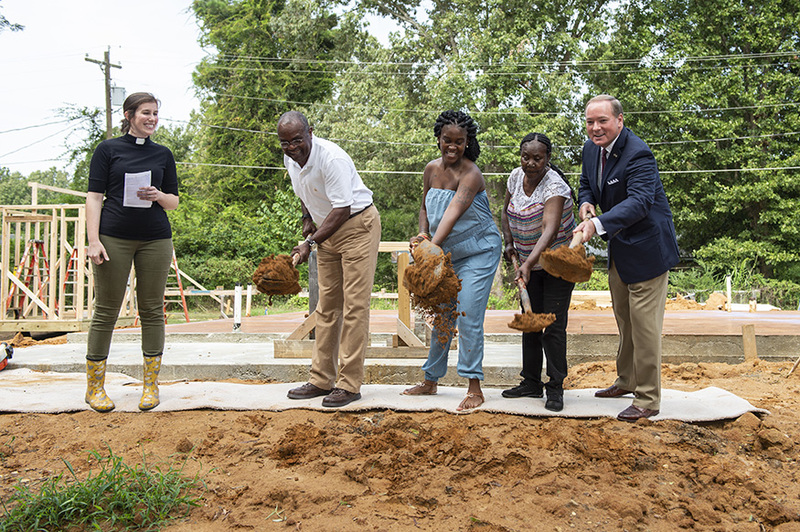 The project, which has been going on for about a decade, provides homes to Habitat-eligible families in the area who need the help, with emphasis on those who are students and/or otherwise associated with MSU. Construction on the home will take place this Fall, with the help of Habitat and MSU volunteers. All in all, the Starkville Area HfH has now built, or otherwise supplied, over sixty homes to local families in need. Students are encouraged to volunteer to help out on these projects; roughly 3,600 volunteers have become involved and generously donated their time, effort, and expertise over the years. More information about the program, for both potential homeowners and for volunteers, can be found in the full article here. 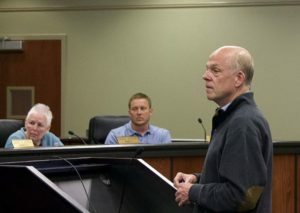 Local attorney Johnny Moore recently spoke with Starkville aldermen on behalf of Tuscalloosa developer Christopher Dobbs at their board meeting. They discussed potential plans to move public housing development Pecan Acres to a new location, freeing up the original site on Highway 12 for commercial development. The Starkville Housing Authority and HUD are also involved with the possible project. The aldermen also discussed potential interest in a planned EMS district, and the matter will be open to input from EMS service providers at their May 1st meeting. The idea is that it should be possible, within the defined district, to house both fire trucks and Fire Dept. ambulances at the same stations, improving response times and allowing easier access to OCH Regional Medical Center. The fact that ambulance services are generally run at a loss, and must therefore be subsidized, was brought up as part of the discussion; it will be discussed further at their next meeting, along with ideas for potential outside firms that can assist with implementation. The Partnership revealed the three charities that will be eligible to win up to $5,000 from Cadence Bank during the sixth annual Restaurant Week later this month. 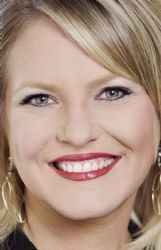 Partnership Director of Tourism Jennifer Prather has announced that The Partnership has selected this year’s charities who will be receiving grants based on patronage during Restaurant Week, later this April: Christian World Missions, the Oktibbeha County Humane Society and the United Way of North Central Mississippi. These were selected from a pool of nominations sent in by the community. During Restaurant Week, patrons at certain restaurants will be given the opportunity to “vote” for one of the three charities; the winning charity will receive $5,000 from Cadence Bank; 2nd Place will receive $1,000; the last will receive $500. Restaurant week is set for April 22-29. 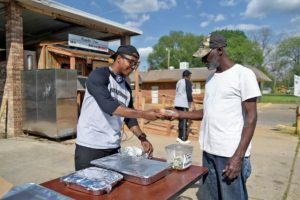 “During that time, we encourage the community and visitors to eat out as many times as they can,” Prather said. “Every time they eat out at a participating restaurant, they can cast their ballot for a participating charity of their choice . . .We encourage everyone to be ready on April 22-29 to eat out as much as they can and help these organizations share the message of the work they’re doing and to get everyone excited about them,” She went on to say. Partnership CEO Scott Maynard said Restaurant Week stated that both local restaurants and local charities benefit from the arrangement: “I think it’s graduated to the point where people recognize it now and really look forward to not only participating in the nomination process, but also through the thousands of votes we receive from people dining out each year,” he said. A group of generous locals have recently begun handing out food to those in need at 14th Ave & 20th St, not far from the Boys & Girls’ Club. They set up shop on Monday afternoons at around the time school lets out; they try to have about 50 meals made each week, and it’s all paid for out of their own pockets, plus the occasional donation. 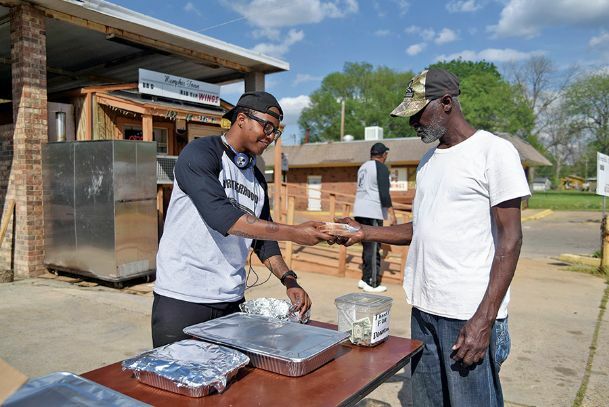 Shannon Scott gives Leon Brewer a sandwich on 14th Avenue Monday afternoon. A different member of the group supplies the food each week. “It’s free, baby,” Willie “Sweet” Scott assured a young girl and her two siblings as he and his friend Charles Clemmons saw to it they each had evertything they needed. The group sets up their stand on Mondays from 3-5 p.m. where they give away whatever they’ve prepared that week. Bring Your Kids, Bring Your Cameras, and Come on Out to the XMAS Tree Lighting and Caroling Downtown! 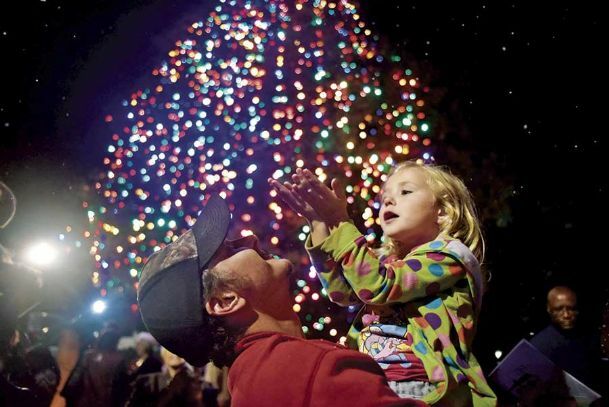 Bring Your Kids and Come on Out to the XMAS Tree Lighting Downtown! Fourth graders from Cook Elementary will be singing carols starting at 5:30PM, and Mayor Robert Smith will light the tree at about 6:15 p.m. Kids will be able to make craft items to take home, and everyone will have hot chocolate and cookies; representatives will also be accepting new, unwrapped toys for children aged 3 to 12 for the community toy drive. Santa & Miz Claus will be on hand, along with a professional shutterbug to help preserve memories of the night’s festivities. Local event sponsors include Rex’s Rentals; Colin Krieger, RE/MAX Partners, Starkville-Columbus; DMayfield Photography; Visit Columbus; McAlister’s; and Coffeehouse on 5th.